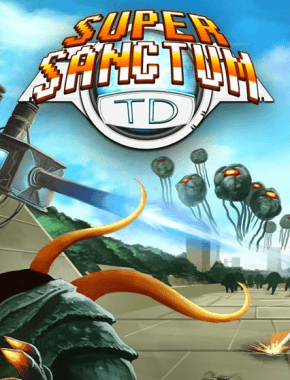 Sanctum is Coffee Stain Studio’s tower defense/first person shooter crossover series. 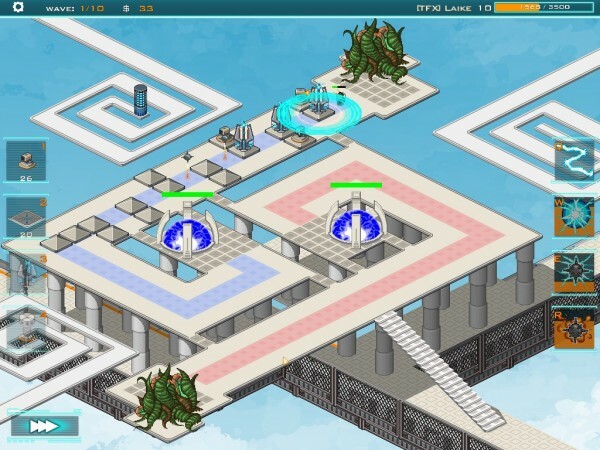 Super Sanctum Tower Defense is a retro take on the series that was released alongside Sanctum 2. The FPS perspective is replaced with a traditional isometric view and the three dimensional graphics now features SNES graphics. Super Sanctum Tower Defense is a casual take on the series. There is no plot in the game and the Core Guardians have an extremely small part in the game. The units and buildings will be familiar to players who have played the other Sanctum titles, but no effort is made to introduce new players to the Sanctum universe. The tower defense mechanics play exactly like the Sanctum series. The player is presented with a blank level and is allowed to build walls to control the movement of the incoming enemies. The enemies will take the most direct route to the player’s core. Each enemy that reaches the core will do a certain amount of damage to it. When the core’s health reaches zero, the game is over. Each map is a different design, which force players to create the most effective maze possible based on the landscape. The players can only choose up to four tower types and four active abilities to use in each map. The player starts with a small amount of money to buy towers and gains more money by killing enemies, picking up crates of cash randomly dropped by enemies, and successfully completing levels. Towers can be upgraded twice to provide great range, firing rate, and damage. Just like the full game, augmenting the towers and active abilities are a variety of perks that can be purchased between levels. The perks can improve certain types of towers, improve active abilities, improve money flow, and provide some general advantages. Super Sanctum Tower Defense is a deceptively difficult game. There are two levels of difficulty and two modes of gameplay. Survival mode will throw an endless stream of enemies at the player’s defenses. The longer players can hold out, the higher their ranking on the online leaderboards. The regular mode will pit the players against a set amount of waves. The normal level of difficulty can be beaten by players of any skill level, but a perfect level will challenge tower defense veterans. There are a large variety of towers to choose from, each with an optimal condition for use. 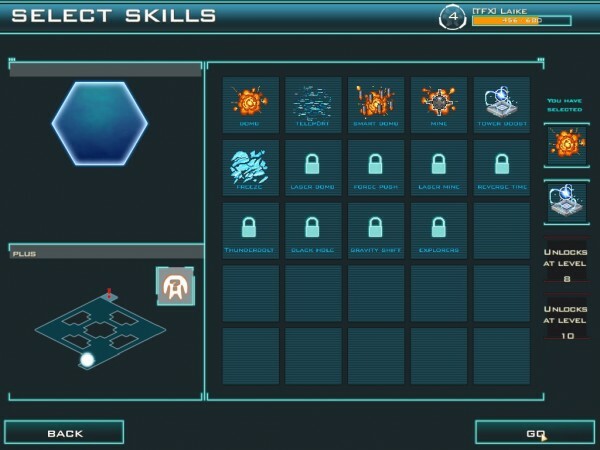 Players will need to create a working strategy and choose a skill tree build that will best suit their plan of attack to succeed at the game. Almost all of the enemy aliens in the Sanctum universe make an appearance in Super Sanctum Tower Defense. 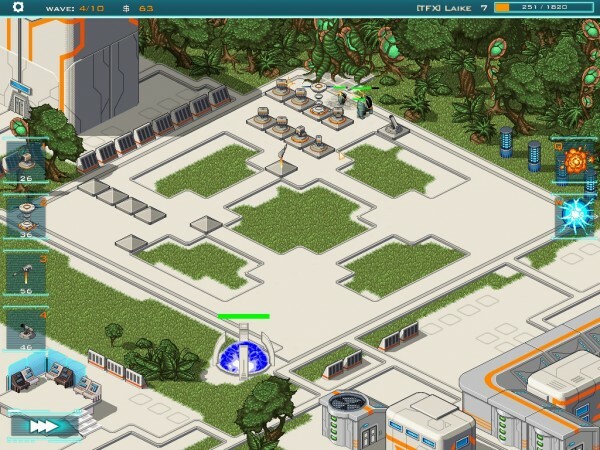 The player will encounter a large number of generic Walkers, but special aliens like the quick groups of Runners will test the flexibility of the player’s defenses. The game throws a larger wrench in the machine by throwing flying units that fly over walls and take the most direct route to the core at the player. Certain towers only fire at air or ground units, which forces the player to make difficult choices during pregame tower selection. To provide players a chance to counter these units, each tower can be given specific targeting instructions, such as preferring to shoot at the healthiest enemy. The controls in Super Sanctum Tower Defense are relatively simple. The game can be played with the mouse only, with players dragging and dropping abilities and towers into the right spot. However, since active abilities have a small time window where they are more effective, Super Sanctum Tower Defense is best played with a mouse and keyboard. The four towers are bound from keys 1-4 and the active abilities are bound to Q,W,E, and R. Unfortunately, there is no way to change the key binds, so left handed gamers may find themselves frustrated. 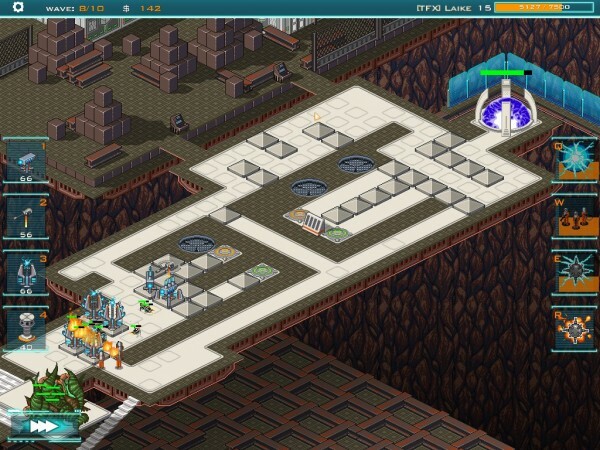 Super Sanctum Tower Defense is retro 16-bit take on the series’ sterile visual style. The visuals are a departure from the series’ three dimensional graphics, but are instantly recognizable as Sanctum with its white and blue colour scheme. The whole series has been reimagined as an SNES game and looks great to boot. My only complaint is that the game is locked at a 1024 x 768 resolution. There are no options to tweak the visuals. The audio follows the retro theme with blips, bloops, and chiptunes. The music isn’t bad to listen to, but it isn’t the greatest thing. I found myself turning off the music and sound effects after a while out of audio boredom. 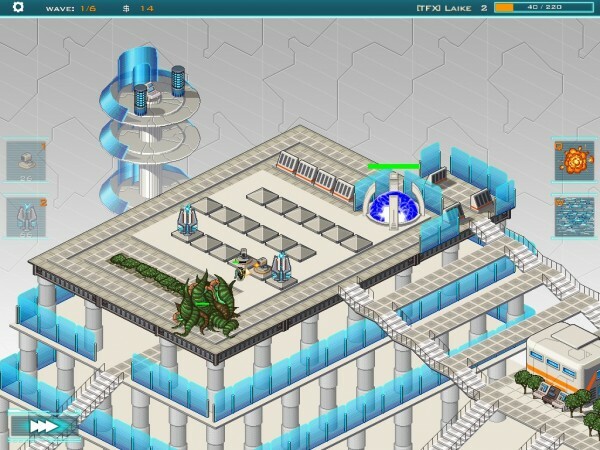 Super Sanctum Tower Defense is a solid game to play on a coffee break or a laptop while on the train to work. At $4.99, the game is a little pricey. The game does strip out the unique FPS mechanics from the Sanctum series, but is still an entertaining tower defense game that stays true to its roots.